When my goddaughter was young she did not care for history class and would ask, "Moshe, why do we need to study history." Now she is an adult and of course she knows. She is wiser than many of her generation, but then again she lives in Israel. Here we have no choice but to confront the truth of history. Here we live history every day. There are historical facts. Of course there is always interpretation of facts; what lead to the outbreak of World War Two? Why did the American government not attack the Japanese fleet before it attacked Pearl Harbor? Why did the Vatican not come out openly against genocide? These and thousands of other questions are discussed and debated in countless books and there are many differing opinions. And then there is fact. What is a fact? A fact is a proven event. It is a fact that World War Two took place. You can not say, "I am entitled to my opinion and I say World War Two did not take place." No. That simply makes you an idiot. But it really makes you more than an idiot. It makes you dangerous to society and to our future. There are historical facts. That means no serious historian disputes them. No one will say that Russia did not participate in the war. No one will say that France was not soundly defeated, no one will deny that over a quarter of a million American soldiers died fighting for a free Europe. These facts cannot be denied. And yet people do deny them. 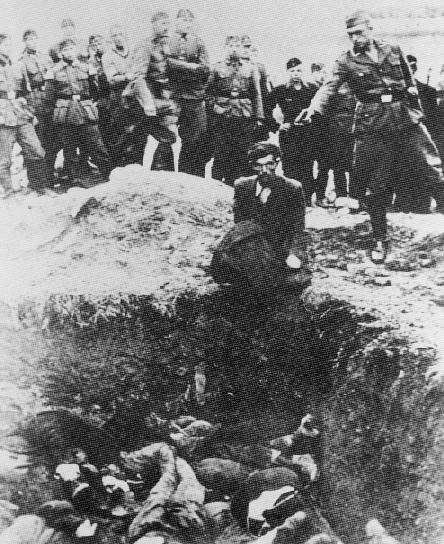 People deny that the Holocaust, i.e. the massive destruction of the Jewish people, took place. This despite irrefutable proof, film, documents, testimonies, huge archives etc etc. Disputing such facts is not your "right" to express your "opinion" . What it is is a provocation, an insult, an attack, a deep offense to those that suffered and continue to suffer. No, despite what modern society says, you are not always entitled to your opinion. To express an opinion you first need to have some basic knowledge of the topic. These days when someone expresses nonsense, views totally against all historical proof, the defense they offer is "I am entitled to my opinion and you must respect it." No, I do not have to respect it. But where does the danger enter the picture? It is because if you distort the past you endanger the future. If you falsify the past people will not be able to draw the correct conclusions. Johnny was driving recklessly and caused a terrible accident. Clearly there is much to be learned from his mistakes. But what if we do not study the history of this case? What if we deny that he drank before driving, was texting on his phone, was driving way above the speed limit? If we deny all these facts we will not be able to understand the cause of the accident. We will say, well, these things just happen sometimes. Case closed. But we must know the truth so we can understand what happened and what can, and will, happen again. If we say Jews, Christians and Muslims always lived together in "relative peace and harmony" until the State of Israel was born, we are not only dead wrong but we will cause great damage to the future. We would see the State of Israel as a problem when in fact it is the solution. The FACT is Jews were persecuted in nearly every Christian and Muslim land. (The Buddhists never caused us any harm, nor did the Native Americans). The fact is as long as we had no state to protect us we were at the mercy of others. We struggled through periods of only minor prejudice to periods of great persecution. Trouble was the norm, the peaceful periods were few and far between. We had a few good years here and there and then a new king or queen came along and kicked us out or tried to annihilate us. To claim otherwise is not only historically dead wrong but creates the false impression that Jews do not need the protection of the State of Israel, that Jews around the world do not need a very strong Israel. Distorting history is not your right. Expressing an opinion that is contrary to the facts is simply wrong. I can say it is my opinion that cars run on cool-aid, but that is simply wrong. I can hold steadfast to my "opinion" and talk about my rights but that would only make me look like an idiot. If you know nothing about a topic it is better to remain silent and appear a fool then open your mouth and remove all doubt. And when your "opinion" tries to erase tragic historic events, or "reinterpret" them in a more politically correct way, you are simply disrespecting the suffering of others. You are denying their pain. You are minimizing their horrific experiences. I worry about a world where people do not study history.